The NASCAR XFINITY Series Dash 4 Cash that has introduced Two Heats and a Main to competition this season is reaching its conclusion this weekend at Indianapolis Motor Speedway in Saturday’s Lilly Diabetes 250 (3:30 p.m. ET on NBCSN). 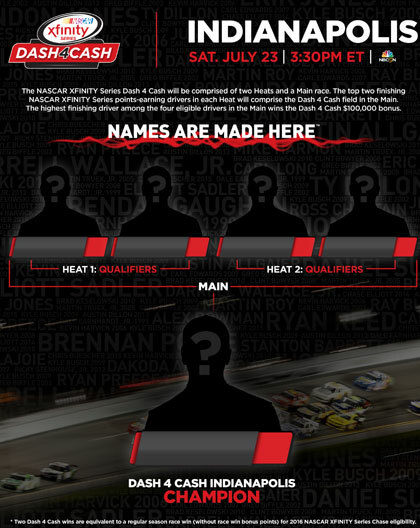 The two Heats will set the starting positions for the Main with the top two NASCAR XFINITY Series regulars in each Heat becoming eligible for the Dash 4 Cash bonus. The highest finishing driver among the four Dash 4 Cash eligible drivers will be awarded a $100,000 bonus. If any driver wins two of the four Dash 4 Cash bonuses available, he/she is all but guaranteed a spot in the 2016 NASCAR XFINITY Series Chase. In short, two Dash 4 Cash bonuses are equivalent to one race win in the new NASCAR XFINITY Series Chase format. Ty Dillon is the only driver with the opportunity to complete the task on Saturday. Erik Jones won two Dash 4 Cash bonuses, but already had a visit to Victory Lane previously. Points Tighten Near Cutoff Line The points between 12th in the NASCAR XFINITY Series standings and 15th have closed from 44 points after Kentucky to 29 following New Hampshire, raising the intensity around the Chase bubble and the drivers vying for a spot in the NASCAR XFINITY Series Chase. Blake Koch currently holds the final spot in the XFINITY Series Chase – 12th place in points – just ahead of 13th-place Ross Chastain (-13), 14th-place Jeremy Clements (-18) and 15th-place Dakoda Armstrong (-29). Koch faces an uphill battle defending the final Chase spot this weekend. He has made two starts at Indianapolis, posting a best finish of 37th. His closest competitors on the Chase bubble have fared quite better and could capitalize at Indianapolis. Chastain has made one start at IMS, starting 30th and driving up to a 22nd-place finish. Clements has made four starts at IMS, recording a best finish of 10th. Dakoda Armstrong also has made two starts at IMS, logging an average finish of 18th.